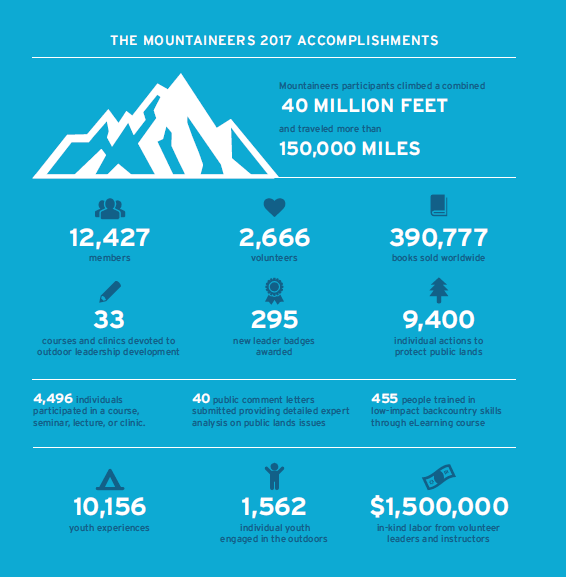 The Mountaineers is a community of enthusiasts who love to spend time together outside and share their love of the outdoors with others. For more than a century, skilled outdoorsmen and women have volunteered to help others experience our wild spaces safely and responsibly while taking action to preserve the outdoor playgrounds we love. No other program can match the energy and enthusiasm people have when teaching and learning from other passionate outdoor lovers who are volunteering their time to share their skills and knowledge. You can hear some examples of how rewarding it can be to volunteer here. There are MANY ways in which you can get involved, from providing administrative support, to managing a program the size of a small business like an outdoor center or climbing program. You can choose to volunteer for a single event like the Banff Mountain Film Festival, help at a beach clean up, or get involved on a deeper level as a leader with one of our activities or courses. The most common way people get involved is by taking one of our courses, joining the committee that offers it, and/or becoming a trip leader or instructor. For more information about volunteering or to read about specific opportunities, find out how you can get involved as a volunteer. Already a volunteer with The Mountaineers? Explore our Leader Resources page for important forms, how-to guides, and helpful information about The Mountaineers programs and structure. Access the Shared Activity Resources files to find useful info from throughout the organization for each of the different activity types.